M104, aka NGC 4594, and commonly referred to as the “Sombrero Galaxy”, is an unbarred spiral galaxy in Virgo, about 30 million light years distant, and probably 1/3 the size of the Milky Way. It is quite bright, and should be visible with 7×35 binoculars. 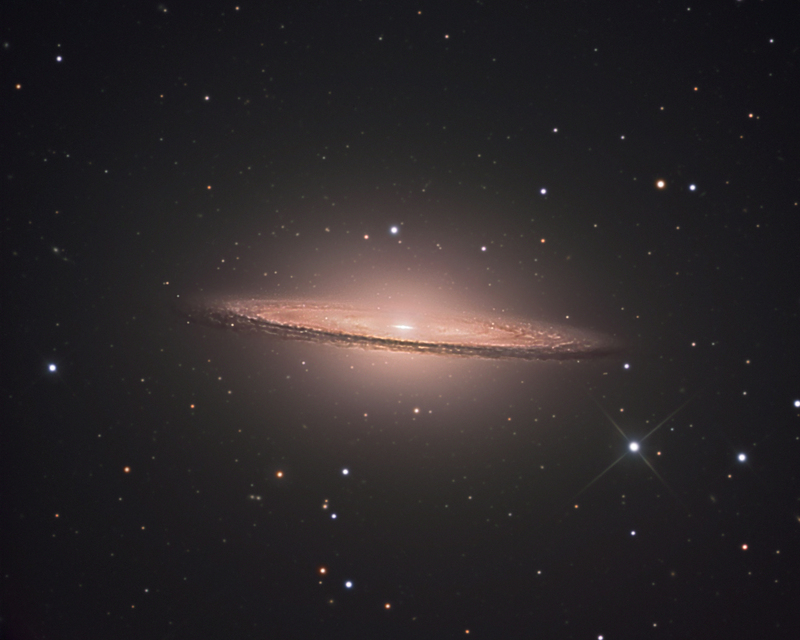 The “sombrero” portion is sandwiched in a bright halo, which might be more consistent with a large elliptical galaxy(?). The nucleus is thought to contain a supermassive black hole, and the galaxy itself also has a large number of globular clusters. For those who remember the 1960’s TV show “The Outer limits”, an image of M104 was in the ending credits. 16″ RCOS at f/11.3, Apogee U9, SBIG 402 guider, Astrodon LRGB with 3.5 hrs lum, 3 hrs/channel RGB, processed in PixInsight and Photoshop. The data was acquired in Chile at CTIO during April/May 2009.